In this story the central character, Nell, is sad because her mother her is ill. This is a central theme for me having spent much of my teenage years with a seriously ill parent. History repeated itself for me when I was diagnosed with cancer in 2015 and my own daughter, Red, then five, had to endure the tedium of long summer days with her mother (me) lying ill in bed. In the book the child, Nell, neglected by circumstances beyond the parent’s control, makes friends with a stray chick – a little bantam called Rosebud. When my sister Clover and I were small we had a bantam, also called Rosebud, who used to sleep on our bed head. I feel very lucky to be able to bring Rosebud to life again in this story. Nell loses Rosebud, searches for her, and in doing so ends up in the circus, where they have a true circus adventure. I hope that the circus will signify here the growth of the imagination, a place of extreme danger but more than that, a place of safety – that is what the circus has always been to me. The circus is a place where you can invent yourself, where you will have to confront yourself, and where you can find family. The circus – a universe for all – it is a place of extraordinary diversity and has the fascination of being a self-contained complete world, a closed system in some ways, discovered through loss and through wanderings and through yearnings. I have often marvelled at the skills of circus people, their extraordinary competence with languages, their dedication to learning their skills, their complete indifference to the world of global celebrity. They are the travelling players who have woven their way through the centuries performing in market places, at religious fairs, in theatres, music halls, exhibition rooms and tents, and I have tried to capture their other world, never never land quality. I feel really proud that OUP have chosen to publish a book set in a circus. I love the circus revival that seems to be happening at the moment. It is a gloriously visual, funny world and there seems to be a surge in film makers and song writers wishing to portray and celebrate circus. 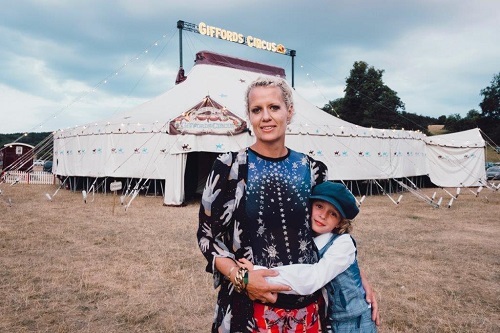 I would like to think that Giffords Circus is a little ahead of the curve with this – we have been banging a drum hard for circus since 2000, putting on a show each year that has been seen by over a million people. I hope that there are children who will read this book or be read to, and who will then come to see the circus, and who will in the process have a sense that their own imaginations, their own dreams and their own visions can come true. Signed copies of Nell & the Circus of Dreams can be purchase for £10 (rrp. £11.99) from the Giffords Circus shop. Nell will be talking about her new book at an exclusive preview event at The Everyman Theatre Cheltenham in the school holidays on 17th April - book your tickets here.